Original 2006 24 Hours of Le Mans Poster. 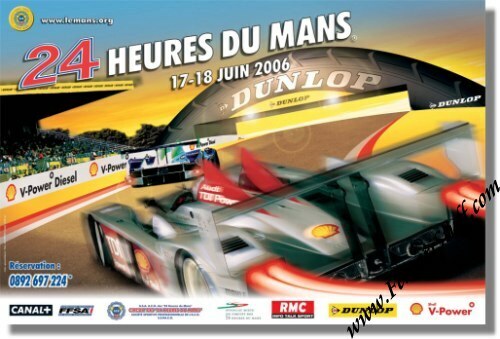 The 2006 Le Mans poster is part of the era in Le Mans posters which is generally described as "The Le Mans Poster in the era of computer graphics and sponsorship" and which lasts from 2001 until the current day. The 2006 24 Heures du Mans poster was produced by the Archimede agency after a color illustration derived from photographs provided by Audi Sport Press. The poster is inspired by both photography as well as graphic design. It gives an impressive sense of speed with the car again as the star but this time seen from behind, an unusual angle.